This ramen broth recipe appears in Food Flirts. 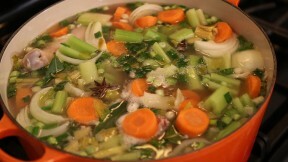 A traditional Jewish chicken broth is used as the base for Ramen Broth. Many of these ingredients are available at Asian grocery stores or at on-line shopping sites. Broth: Add chicken, chicken feet, pastrami, onions, scallions, celery, carrots, garlic, bay leaves, ginger root, star anise, salt, pepper, and water to large heavy pot or Dutch oven. (at least 9-quart pot). Cover and bring to a boil. Use a ladle to skim white solids that float to the surface of the soup and remove. Reduce heat, leave cover ajar, and simmer, skimming periodically as more solids rise to surface, until chicken is thoroughly cooked, 2 to 2 ½ hours. Remove pot carefully from heat. Uncover and cool 15 minutes. Remove chicken and chicken feet from broth with slotted spoon. Reserve chicken meat, and discard chicken feet and bones. Remove pastrami from broth, and discard. Strain broth into a large, clean pot. Care should be taken when straining broth because the pot will be heavy! Remove and reserve carrots and discard all other solids. Cool the broth over an ice bath, (see FF Tip below) cover and refrigerate if not using immediately. Extra broth can be frozen. Place chicken meat and reserved carrots, into separate covered containers and refrigerate for Ramen Noodle Bowl assembly. When the broth has chilled, scrape any fat from the surface with a spoon and reserve in a covered container in the refrigerator. Garnish: Divide the cooked noodles into 6 warmed bowls. Divide the chicken meat, soft-boiled egg halves, scallions, carrot flowers and pastrami pieces among the bowls. Ladle 1/6, about 1½ cups, of the broth into each bowl. Garnish with the nori pieces, chili and chive oils. Serve immediately with chopsticks and a spoon. Soft Boiled Eggs: In a medium saucepan, bring 8 cups of water to a boil. Carefully add the eggs. Boil for exactly 6 minutes. Remove the eggs and place in an ice bath (see FF Tip below) for 10 minutes. While the eggs are boiling, add the soy sauce, rice wine vinegar, and ½ cup water to a small bowl, and combine. Carefully peel the boiled eggs and place them in the soy mixture for 1 hour, turning occasionally for even coloring. Remove from the liquid and store the eggs whole in the refrigerator until ready to use for garnish. When ready to use, halve the eggs, using a cheese wire or something similar to keep the yolks intact. Carrot Flowers: (12 carrot flowers, 2 per bowl) Slice the cooked carrots left over from the Rich Ramen Broth into ¼-inch coins. Using a small cookie cutter in the shape of a flower, stamp flower shapes from the cooked carrots. Refrigerate the carrot flowers until ready to use. An ice water bath is a simple method for cooling hot liquids before combining them with cooler mixtures. It is easy to make an ice water bath in a home kitchen by using two bowls, one smaller than the other. The mixture to be cooled should be added to the smaller heatproof bowl, and then the bowl containing the hot mixture should be placed in the larger bowl, which has been filled with cold water and ice cubes. The hot mixture should be stirred every few minutes until it is cold. Chicken fat (schmaltz) can be stored in a covered container in the freezer for up to 3 months. Nori is the Japanese word for an edible seaweed. It is available from Asian grocery stores. Make more carrot flowers than you will need because they are fragile and may break apart.